Good afternoon! I wasn’t going to stamp this morning. I had big plans in the yard. However, as I was cruising online this morning and checked in with the daily challenges at Splitcoaststampers, I saw that the Ways to Use it Challenge was all about packing today. In general, we can use packing/shipping products such as bubble wrap, shipping tags, packing tape or spin the challenge the other way and use a travel theme such as luggage tags, vacation theme stamps etc. I decided to spin the challenge, being the rebel that I am. When I started downstairs to stamp, I had something in mind for the challenge. Needless to say, once I got started what was supposed to be cute and fun turned into something entirely different. The mojo took over and I was lost in creativity. 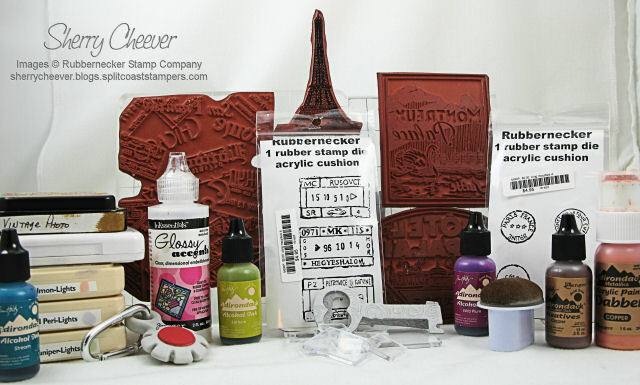 I know, I know – I’m in a stamping slump or at least I say I am. Anyhoo, bear with me. It will probably take me longer to write this post that it did to make the darn tag. I think what I’ll do first today, is actually show you the picture of the products used. That way when I mentioned something, you already know what I’m talking about. I started with a plain manila shipping tag. 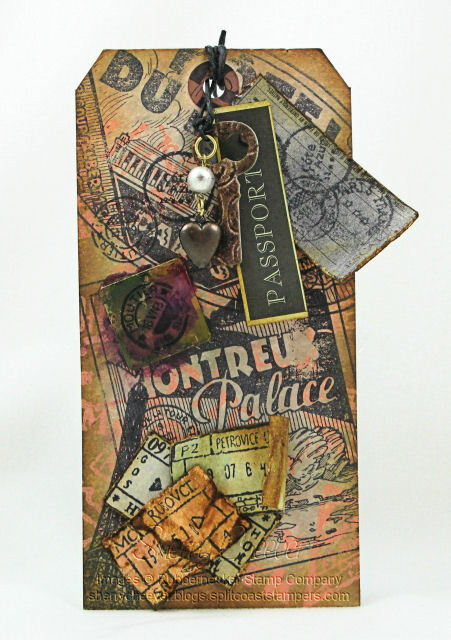 The Travel Background was dabbed with the Copper Acrylic Paint Dabber and then stamped on the tag. Cool Peri, Salmon and Juniper were then wiped across the tag. Using a paper towel, the excess ink was wiped off and since the acrylic paint works as a resist, the ink wipes off the acrylic paint. The remaining images were then stamped in black. The rectangle postmarks were stamped on another tag, cut out and inked. They were each distressed in varying degrees, and mounted on the tag using Glossy Accents. The fragment piece was inked on the back using Alcohol Inks and then a postmark stamped on the front. The fragment was also attached with Glossy Accents. I had a 7 Gypsies passport tag in the stash, and cut out pieces of the tag, ink and distressed them. They are both attached to the tag using a brad. The Grunge Board Key was painted and inked and then tied together with a piece of an old earring with black hemp twine and then tied to the tag. Well, that’s about it for the day. I need to go out and dig some holes! Happy Wednesday! It seems I got to stamp a little earlier today than I have the rest of the week. Of course, I am waiting for it to warm up a bit before I head outside. We’ve been trying to get our backyard into shape, and there is so much that needs to be done. Since we had a good rain last night, I’m going to try and dig up a portion of a snowball bush and plant it in the backyard. I’m also on a carpenter bee killing spree, and I tore the steps away from the spa yesterday. I need to coat the bottom of those with waterproof and get them back into place. Elliot is absolutely fascinated with these bees and I’m trying to get them before they get her. Let’s get on with today’s stamping. It’s a simple card for today’s Splitcoast Sketch Challenge. 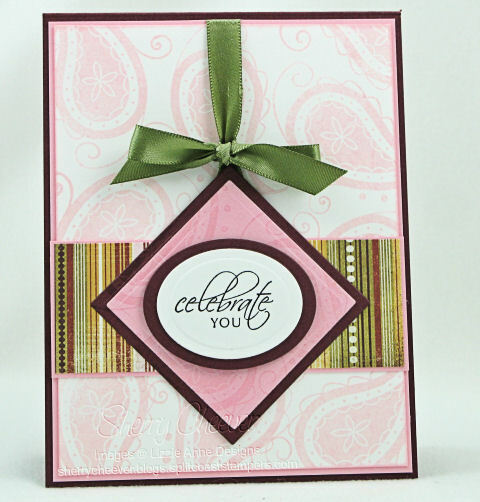 The background was stamped with Big Paisley, as well as the pink panel under the sentiment. I used a strip of BasicGrey Sugared for the middle and matched the rest of the paper to that. When the card was finished, the top needed a little something, so I added the ribbon. 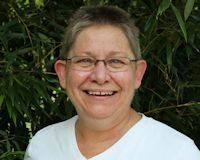 I would like to take a minute before I go today, to thank each and every one of you who have read Kate’s Story and made a donation to our 2008 Epilepsy Walk Team, Bug Bug Walkers. Your comments, generosity and thoughtfulness have completely overwhelmed me. I continue to get a little choked up each time I think about it! Actually, it leaves me a loss for words – and here I go again, so it’s time for me to go outside today.